If your downloads are not as fast as you'd like, you can always turn to a download manager. However, most of these programs are a bit complicated and they tend to get in the way. Fortunately, such is not the case with Motrix. 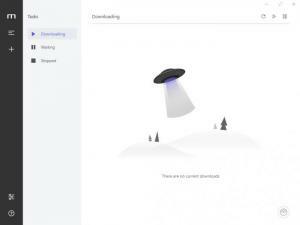 This lightweight utility is capable of boosting your download speed significantly without adding any extra burden on you and, most important, without getting in your way when you want to download a file normally. If you need the extra speed, you can turn to it and get exactly that, but in all other cases, the program will sit quietly in its corner. Motrix is distributed as a freeware application, for Windows, Linux and Mac OS X. You can have it up and running in under a minute, without making any complicated settings. Furthermore, the software doesn't require any third-party tools or services, and it doesn't use a significant amount of resources. The application supports up to ten concurrent download tasks, and it's capable of accelerating them significantly. Of course, your hardware and Internet connection are still factors you should take into account, but you will certainly see a difference, especially when downloading large files from the Internet. All you have to do is copy a download link to the clipboard, create a new task on the software's interface, paste the link and start the operation. Active, paused and completed tasks are organized on separate pages on the software's interface, which you can access instantly via navigation tabs. Each task is displayed together with a few options for pausing, resuming, opening the destination folder and others, so you can perform these actions at a moment's notice, without any complications. Besides downloading files through standard HTTP protocols, you can also use Motrix to download data through bittorrents. Instead of pasting a link, when creating a new task, you can browse for a torrent file, and the software will start downloading right away. If you look in the software's settings panel, you will find an option for enabling support for more download protocols, though this feature may still cause stability issues at the time of writing. Regardless of what you need to download and how large it is, Motrix will help you retrieve it as fast and easy as possible. You can download data much faster than with any web browser. The software can run up to ten download tasks simultaneously. It doesn't use too many resources, and it doesn't get in your way. The possibility of integrating Motrix with a browser, to add a "Download with Motrix" option in the context menu would be a welcomed addition. You can download Motrix free here.